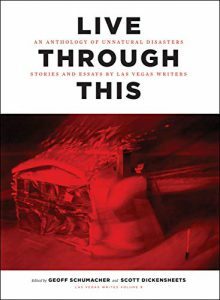 The Las Vegas Writes Project and the editors, publisher, and contributors of LIVE THROUGH THIS: AN ANTHOLOGY OF UNNATURAL DISASTERS, launched the book at the Clark County Library on October 18th with a panel discussion. In the photo above (from left to right) are David G. Schwartz, publisher Anthony Curtis, editor Geoff Schumacher, Andrew Kiraly, yours truly Megan Edwards, John Hay, editor Scott Dickensheets, F. Andrew Taylor, Jarret Keene, Kristy Totten, Kim Foster, Jason Scavone, and C. Moon Reed. Not pictured is Lissa Townsend Rodgers. You might think that a panel of twelve might be unweieldy, but Geoff and Scott did a masterful job of moderation, and contributors all got a chance not only to read an excerpt but also to pontificate a bit. Half short stories and half essays, the book reflects the theme of unnatural disaster. Some authors chose to delve into history, others focused on the present, and some created scenarios of a possible future. As a whole, the pieces portray an authentic Las Vegas, the city I once thought I could get to know in “a couple of weeks.” Now that I’ve been here nearly two decades, I realize I will never truly know my adopted hometown completely. So I keep exploring, listening, observing. And sometimes, as we all did a year ago, I cry. This book is like a choir singing in harmony to produce a single work. Like a mosaic, a textured image emerges as you read through it. I felt as though I started at “Vegas Strong.” When I finished, not long after this new October 1, the revised motto seemed to fit a little better: “Vegas Stronger.” The pen is not only mightier than the sword — it also heals. If you’d like to see what I mean, you can get a copy of LIVE THROUGH THIS on Amazon in either print or ebook format.